Graduating from Bombay Homeopathic Medical College in 1984, his First patient from abroad was in 1985. The global patients vary from per families from countries like Ethiopia to the family of the ex-president of the United States. Besides his teaching visits to countries and his articles in the international periodicals, the Internet has played a major role in helping his patients find him directly at the Homeopathy Information Cell, a unique interactive service on the Internet. The enumeration in the Limca Book of Records, 2001 (page 127) takes note of the fact that over the period of the last 15 years. Dr. Rajesh Shah has been Communicating with the people through various media to spread the message of homeopathy, " I am a homeopathy activist." says Dr. Shah adding "my responsibility towards my patients who visit me all the way flying over 12,000 kms, is all the more. I am morally bound to make sure that their faith in homeopathy grows". The patients who consult Dr. Shah in Mumbai or through the internet, usually present difficult disease situation such as resistant skin diseases like eczema, Lichen planus, Vitiligo, allergies, ulcerative colitis, asthma, rheumatoid Arthritis, migraines, Multiple Sclerosis, etc. When asked if patients consult him during his teaching in foreign countries, Dr. Rajesh Shah replied: "Yes, they do. In fact, there are always appointments long before I am scheduled to visit any countries for a teaching. The references come from the doctors and students who attend my seminars." Dr.(Mrs.) Rupal Shah, who is a part of the homeopathy promotion project started by Dr. Shah, handles the cases of children and females in particular. "It is pleasure treating children who suffer from respiratory problems such as asthma, where homeopathy has a great role to play. Asthma in children is common not only in India but also in countries like USA, Australia, Sweden and England." says Dr. Rupal Shah. "Treating patients from over 80 countries has been a great experience for me," says Dr. Shah who has treated patient as poor as those in the Ethiopia or Tunisia as well as the film stars in Hollywood and ministers, including the family of the ex-president of the US.
" During last five years, I have answered over 40,000 questions from people over 150 countries," Dr. Shah says further. The facility is completely free and non-obligatory. 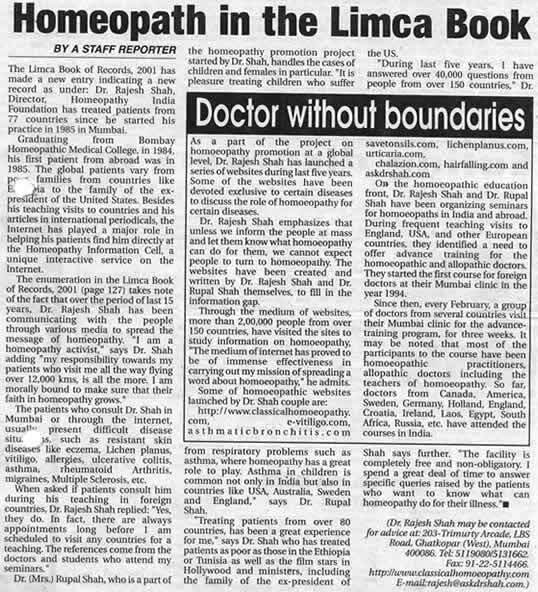 I spend a great deal of times to answer specific queries raised by the patients who want to know what can homeopathy do for their illness. As a part of the project on homeopathy promotion at a global level, Dr,. Rajesh Shah has launched a series of websites during last five years. Some of the websites have been devoted exclusive to certain diseases to discuss the role of homeopathy for certain diseases. Dr. Rajesh Shah emphasizes that unless we inform the people at the mass and let them know what homoeopathy can do for them, we cannot expect people to turn to homeopathy. The website have been created and written by Dr. Rajesh Shah and Dr. Rupal Shah themselves to fill in the information gap. Through the medium of websites, more than 2,00,000 people from over 150 countries, have visited the sites to study information on homoeopathy, "The medium of internet has proved to be of immense effectiveness in carrying out my mission of spreading a word about homoeopathy." he admits. e-vitiligo.com, asthmaticbronchitis.com, savetonsils.com, lichenplanus.com, urticaria.com, chalazion.com, hairfalling.com and askdrshah.com. On the homoeopathic education from, Dr. Rajesh Shah and Dr. Rupal Shah have been organizing seminars for homoeopaths in India and abroad. During frequent teaching visits to England, USA and other European countries, they identified a need to offer advance training for the homoeopathic and allopathic doctors. They started the first course for foreign doctors at their Mumbai clinic in the year 1994. Since them, every February, a group of doctors from several countries visit their Mumbai clinic for the advance training program, for three weeks. It may be noted that most of the participants to the course have been homoeopathic practitioners, allopathic doctors including the teachers of homoeopathy. So far, doctors from Canada, America, Sweden, Germany, Holland, England, Croatia, Ireland, Laos, Egypt, South-Africa, Russia, etc. have attended the courses in India.